The Ouran High School Host Club’s precious stuffed bear can now be a t-shirt you’ll never want to leave home without. Wear this Kuma-Chan graphic t-shirt to school and impress your Senpai or to your next tea party. Have this lovable woodland creature spend all day, every day with you as you work or study! 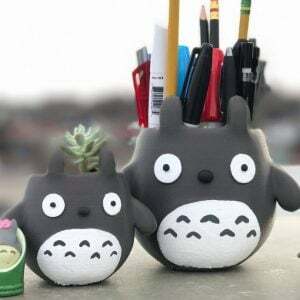 Totoro will be there to help keep your desk organized, saving you the trouble of shuffling around a neglected work station trying to find a pencil. Surprise everyone at your next event with these Pokemon themed birthday invitations! Featuring attack moves as the party details, you will also have a custom picture of you along with your favorite companion. Pay tribute to one of the most powerful Titan by transforming yourself into the Armored Titan!! Made from durable plastic with adjustable straps this mask features detailed armored skin which makes it great for cosplay. Enjoy a wireless experience the next time you play your original Super Nintendo! The Retro Receiver is a bluetooth receiver that allows you to play your SNES wirelessly with any 8Bitdo controller or modern ones from the PS3, PS4, Wii and Wii U! Madara has transformed into a soft and relaxing pillow so you can take satisfying cat naps! Featuring a sleepy Madara on the hood, this Natsume’s Book of Friends neck pillow will help block out sunlight while you try to catch some sleep travelling. Forget Angry Birds, let’s crush some Koopas! This portable version of the retro duo NES/SNES system can now take your collection of classic games to the road! Because button smashing is far more satisfying than screen swiping. Meet the NES Paul, an electric guitar made from an original Nintendo Entertainment System! This re-purposed console features a regular six string guitar that’s worthy only of a true retro gamer and guitar enthusiast. Saving Princess Zelda can wait! Plant yourself under a tree and start drawing in your new Breath of the Wild sketchbook. It looks just like Link’s Sheikah Slate which makes it great for a cosplay piece as well! Top off your favorite bottle in the name of the moon! Moonies can now preserve freshness, flavor and aroma with this gorgeous Sailor Moon scepter stopper. Made with sturdy metal, this wine stopper will fit any bottle, keeping it fresher for longer.